What if black Americans walked away from football? This is why, at the beginning of the season, when San Francisco 49ers quarterback, Colin Kaepernick, took a knee during the national anthem in protest of police brutality, millions of Americans felt as if he were kneeling on their chest. Beyond tweets, the dissenting reactions ranged from curious to frightening. Some fans burned jerseys. A few companies canceled endorsements. Others even mailed anonymous death threats. But in the swirling fallout from the protests, the NFL arguably produced the most peculiar response of all. 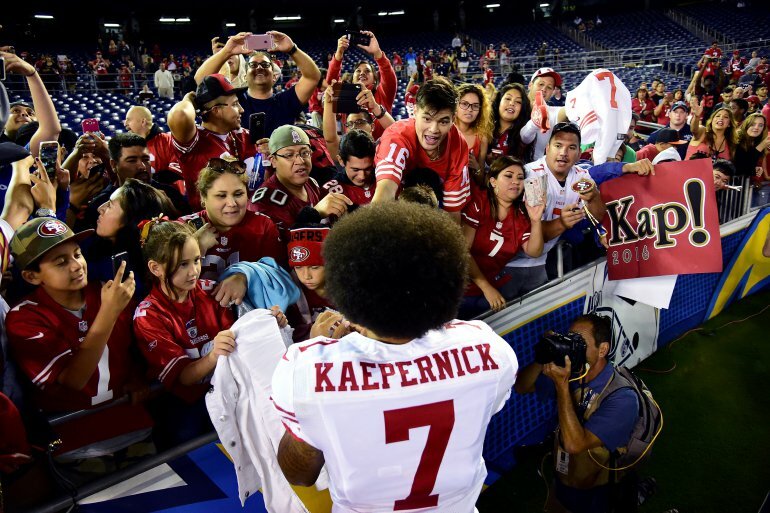 Following Kaepernick's advocacy for black Americans, the National Football League — a league that is 68% black — offered nearly zero support for the cause. Even after several high-profile police shootings of African Americans and federal investigations showing the systemic scope of racist policing, the League remained eerily quiet. No major press releases. No in-depth interviews. Only one fleeting comment from the NFL commissioner, Roger Goodell, who said Kaepernick had the right to protest, but that he did not “necessarily agree with what he is doing.” Goodell’s austere tolerance toward the protest was reiterated by the teams that published statements. “We recognize the right of an individual to choose and participate, or not, in our celebration of the national anthem," wrote the 49ers referring to Kaepernick. The Miami Dolphins echoed the same writing “we also recognize that it's an individual's right to reflect during the anthem in different ways,” after four of their players joined the kneeling demonstration. Through these tepid and measured comments, the NFL separated itself from Kaepernick, his supporters, and criticisms of police racism in general. But given the League's deep ties to the black community, the lukewarm stance towards black advocacy warrants explaining. Black communities are the bone marrow of American football. They comprise a two-thirds supermajority of NFL athletes. This oversized representation spawns out of areas with large black populations such as Miami, Florida. In the 2015 season, Miami was the hometown of more active NFL players than any other city, and the metro-area has produced big names like Isaac Bruce, Santana Moss, Willis McGahee, Michael Irvin, Chad Johnson, and more. Each year, the League draws talent from large black locales like Miami, New Orleans, Chicago, and Atlanta. And each year, these black communities suffer under the injustice of police violence. According to the most recent data from the Washington Post, police officers shoot and kill blacks at 2.5 times the rate of whites. With such a sharp disparity in black fatalities and such a heavy dependency on black athletes, it seems that the NFL would jump at the opportunity to advocate against racist policing. However, after decades of operating a near monopoly on black athletic talent, the NFL has grown lazy. But this golden age of recruitment is coming to a close. Today, doctors and sportscasters alike warn against links between football and Chronic Traumatic Encephalopathy (CTE), concussions, and other the long-term health risks. In 2014, NBA superstar LeBron James said that he wouldn’t allow his kids to play football, and he’s isn't alone. More than 87 percent of parents worry about their kids’ risk of injury while playing sports according to a recent ESPN study. The injury that gave them the most anxiety? Concussions. The sport they worried them the most? Football. Against rising injury fears and the growing popularity of other sports like basketball and soccer, the NFL cannot stand idly by on the issue of racism and policing without risking the loss its most important demographic. Intuition suggests that a fear of ostracizing conservative fans is holding the NFL back. But if the NFL found the courage to support Kaepernick or the broader movement to end racist police brutality, it wouldn't be the first time they spoke up for minority rights. Earlier this year, the League offered a full-throated endorsement for LGBT equality. “Anything that discriminates, we oppose,” Goodell said referring to North Carolina’s controversial HB2 bathroom law. “We will continue to fight... we’re going to work with the community to make the effective changes necessary long term,” Goodell declared. For a sport as defined by gender roles as football, this is no small thing. It's a definite step in the right direction. When the NFL spoke up for the LGBT community, they risked alienating many of their fans, but they felt it was worth it. Only time will tell if League will show similar support for black Americans. Thus far, they’ve been sluggish. Maybe that’s because right now, it's hard to imagine basketball’s popularity, CTE, police brutality, or anything at all posing a real threat to the NFL’s well-being. With millions of fans and billions in revenue, the league’s posture stands as formable as its big burly linemen. Yet, as we’ve seen in recent years with ex-players’ crumbling health, even giants and titans can stumble and fall. Aaron Coleman is a graduate student in New York Univeristy's Business and Economic Reporting program. He is interested in how racism and capitalism impact black Americans. In his spare time, he enjoys reading, running, listening to hip-hop, and eating chicken wings with french fries and bleu cheese. You can follow him on Twitter @arcwrites. For more submissions like this, sign up for Blavity's daily newsletter.